Cosmetic acupuncture is an effective non-surgical method of slowing down the signs of aging to help rejuvenate facial tissues. It is a holistic alternative to cosmetic plastic surgery, and other invasive procedures. This form of acupuncture protocol is designed to increase circulation to the face promoting collagen production for increased tone and elasticity. The Meizen (meaning beautiful person) Protocol was developed by Dr. Martha Lucas from Denver, Colorado. She studied techniques performed in China and developed her own protocol system. Her emphasis is on harmonizing the internal function of the body in order to reduce stress promote healing from within. Very fine needles are applied to the face intended to stimulate specific acupuncture points and to revitalize the targeted areas. The increased collagen production helps the skin to regain its vitality and fill in the finer more superficial lines. 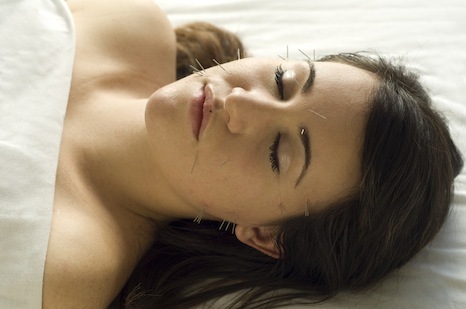 Strategic acupuncture points help bring tone to relaxed muscles giving the face a slight lift. Sometimes redness may ensue after treatment due to increased blood circulation and sensitivity in the underlying tissues. On occasion, rarely, a bruise may occur due to a micro trauma where the needle was inserted. The protocol is based on 10 treatments performed within a five week period–two per week. One treatment prior to the beginning of the protocol is used to do an initial assessment and an acupuncture treatment to determine whether the treatment is appropriate at this time in your life. Clients who are pregnant or who have been diagnosed with high blood pressure are not candidates for this treatment protocol. reduction of: wrinkles–fine and deeper lines, sagging cheeks, crows lines, frown lines and more. Other benefits of treatment include: lifting of droopy eyelids, reduction of age spots and an overall rejuvenation that is not only confined to your face.